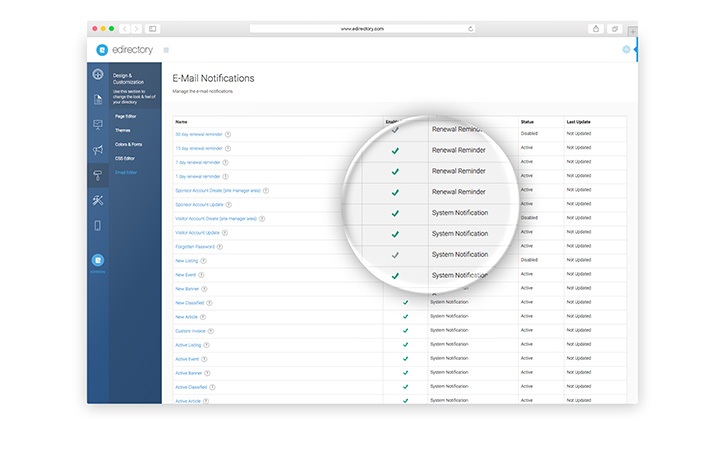 Remain in near constant contact with customers with our fine-grained controls that help ensure your customers only receive the emails that you decide are pertinent. Even in this age of social media, email is the most powerful way to drive engagement. eDirectory features a number of customizable email notifications, designed to build your brand. Listing owners are notified automatically when their listings are expiring automating your revenue collection process. The site manager has the ability to customize the content of a variety of emails, which will be sent to different recipients such as renewal reminders, forgotten password, or visitor reviews. You can customize all the emails in the system, catering the language to fit your particular audience.